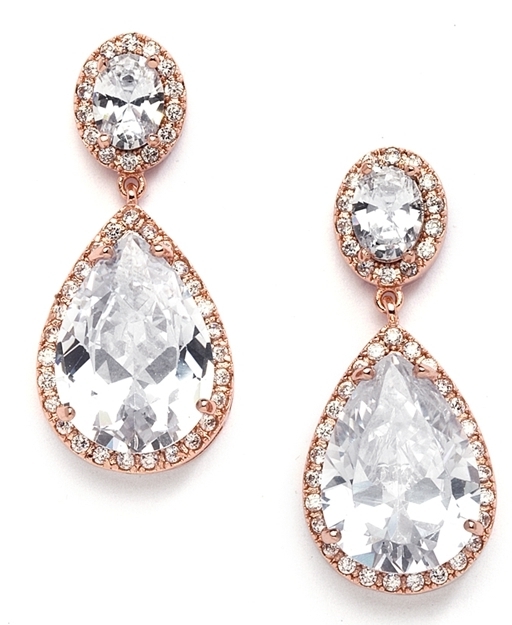 * Mariell's beautiful clip-on CZ bridal earrings feature Rose Gold pave framed ovals & a brilliant pear-shaped drop. * These best selling Rose Gold plated clip wedding earrings are 1 1/2" h and are our editor's choice for brides or mothers of the bride! * Mariell's top-selling couture wholesale bridal earrings feature pave framed ovals with a brilliant Cubic Zirconia pear-shaped drop - now available for the first time ever in rose gold with a clip back! * Add these Mariell exclusive wedding or special occasion earrings to your store's jewelry collection and watch these popular earrings sell as fast as you add them to your display!